I’ve been a BAD Blogger! I did not complete my 10 day Beauty Challenge! I’m so ashamed! I was soo close! I knocked out 9 out of the 10 days in a row but Day 10 got sidetracked with the zillion and one things going on in my life at the moment! However, as the saying goes its better late than never, so here is my belated 10th and FINAL challenge! I spent half my life growing my hair long! Ever since I was a little girl… or tomboyish girl I”ve envied the other girls that had long flowing hair. My mother always used to insist on cutting my hair and her choice of tools included a comb that she ‘pretended’ to use, a pair of scissors that were blunter than anything you know and a round bowl to use as a reference! I guess that has given me some sort of complex with my hair. Now I feel the longer it is the better, I hate having short hair!! Don’t get me wrong it looks great on others but I just always felt that there are so many more things you could do with longer hair. However, I’ve realised that I actually don’t do very much at all. The occasional curling and straightening. Perhaps a Top Knot here and there, but that’s as far as it goes really. So, for Today’s Challenge I thought it would be nice to experiment with some new things and I decided to go for plaits since they will be making a nice come back for the Spring! So must get practicing now then! I created this look from a tutorial I saw online. It’s relatively simple to do. I started by French Plaiting the side. Then tied the rest into a messy knot at the back. Then finished by wrapping the plait around the knot and pinning it into place. 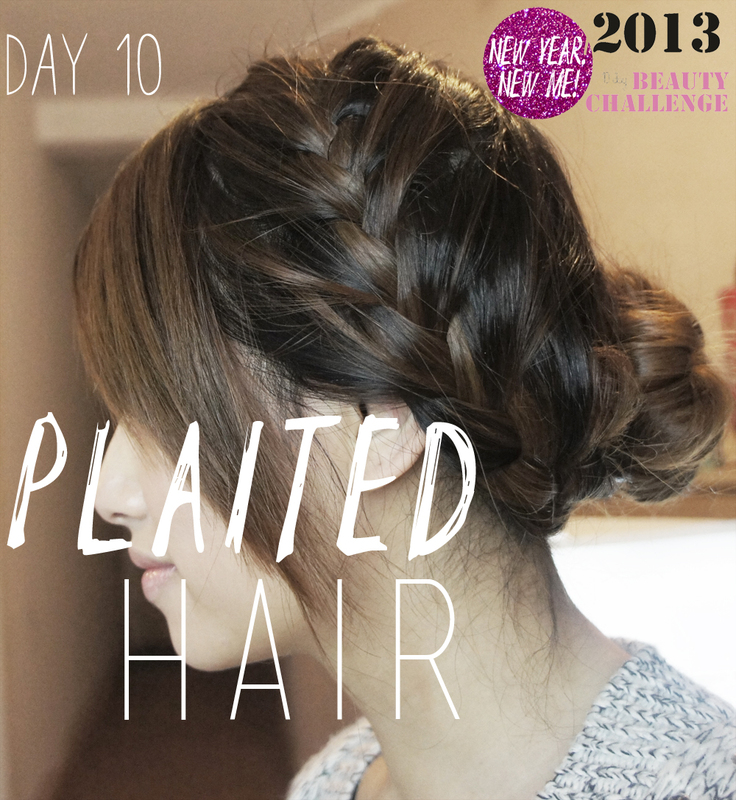 Tags: Beauty, Beauty Challenge, French Braid, Hair, Hair bun, long hair, Plaits. Bookmark the permalink. Not sure i could quite manage this on my own but you’ve done a great job! So cute:) And looks like something I can do! LOL! Thanks for sharing! I will for sure:) You should check out my hairstyles on my blog as well :) And tell me what you think!! !